To celebrate, we’re having a special Irish night this Saturday night 27th April starting with a special Irish church service at 5pm, then an Irish dinner, with trivia, games and other special items. Plus, Cameron’s also preaching on Sunday morning the 28th at 9am, so you can hear his Bible teaching in the morning at a more-classical Anglican Holy Communion service, if you’d like. 1 How do we know what Jesus prayed in his private prayer on the night before he died? 2 What hymn was sung at the Last Supper? 3 If Judas repented, then would Jesus have forgiven him? 4 Does our preference for unity show an innate desire for God’s love? 5 When God said “let us make man in our image”, is this the same “us” as John 17:21? 6 When we are in heaven, will we be able to speak to Jesus’ disciples and dead friends? 7 How should we respond to a Jehovah’s Witness when they come to our door? 8 Is casting lots the same as gambling? 9 Is it a sin to question God’s existence? So, don’t miss out on a special weekend of church as we gather to learn about the church of Ireland and the special plans God has for the future! The _____ of the disciples was eroding. ________ amongst Christians is unfortunate. We became believers by _________ the disciples’ message. This message is the basis for our ______. Unity can only exist in _____. It is a deep _____ in the Trinity. Our unity is so the world _____ that Jesus is the Son of God. As Jesus revealed _______, he revealed his glory. He wants us to have unity so we know the Father’s ____. When we are one, we feel the ____ of God. He prayed for us to see him in his ________ glory. The world doesn’t ____ the Father. We are truly ______ with Christ. We who are ‘in Christ’ will ____ with him. This weekend we complete our three-week series ‘What would Jesus pray’ from John 17, as we examine what Jesus prayed for us, in verses 20 to 26. BCA (Bush Church Aid) is our mission of the month. Support at the ‘Mission Table’. Go to www.jamberooanglican.com/talks or search ‘Jamberoo’ on iTunes Podcasts. Our Good Friday service will be held at 9am. Our other two services will run at normal times during the Easter weekend. Jamberoo is remembering Anzac Day on Saturday 20th April 10.30am. Jodie will be reading the Bible and praying. Next Saturday 27th April we welcome Cameron Jones from the Anglican Church of Ireland, to preach and share about his plan to plant a church in the most gospel-poor, English-speaking nation. Irish dinner, trivia, and much more! He will also preach at 9am. You’re invited to the Rectory at 2.30pm next Saturday 27th April to hear Cameron Jones chat more fully about the Dublin Docklands church plant and the prayer and financial needs for the future. During May, we’ll be hosting three youth ministry students from Canada.Can you billet a student for a week? CAN YOU HELP WITH OUR KIDS? We’re expanding our kids’ ministry on Saturday night and we need people to be helpers for creche and our kids’ programs. Can you help occasionally? Saturday 15th June 9am-2pm in Dapto. Speaker: Sam Chan. Don’t miss it! Each week we need to receive $2650.00 in order to meet our commitments. In the last calendar month, our average weekly giving was $2681.00, leaving a gap of $-31.00. Up to the end of the last calendar month we needed to have received $34,450. Compared to that total we received $30,345, leaving a gap of $4,105. Electronic giving is a great way to give! It helps us prayerfully plan our giving, and then the bank will help us keep that commitment, even when we may be unable to attend. To give by direct transfer then these are the details. Account name: Church of England Jamberoo. Account number: 10081274. BSB: 062562. We have a desire for _______. It seems wrong to punish an ________ person. Jesus gave himself as a _________. All three men will experience _____ together. All Jesus could think of was ______. They offer ______ as they mock him. People _______ to the statement that Jesus is King. They all knew that ______ people was Jesus’ job. All people will be ______ by God. The criminals are punished ______, but Jesus is not. He asks Jesus to ________ him. Jesus promises the criminal a _____ in his kingdom. Jesus _______ his sinlessness for our sin. By _____ you have been saved, not by works. 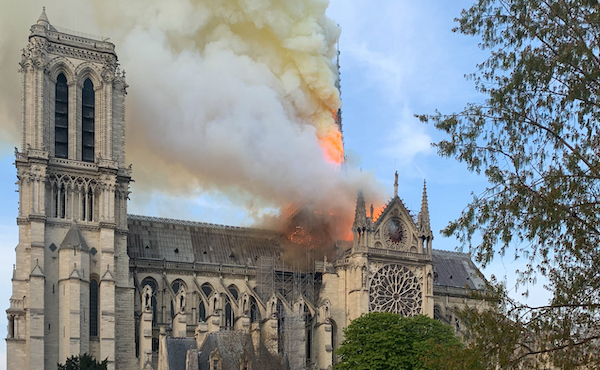 As news broke of the fire at Notre Dame, the world united in shock and sadness. This Parisien icon had towered over the landscape for 850 years, and yet it now had succumbed to the power of fire. Some might say it’s only a building, but there is a good reason why the citizens of Paris wept over its destruction. For many, it was a place where they came to meet with God, and for others, it was a symbol of European Christianity. For me, I was reminded of another, impressive place of worship that also suffered enormous destruction. The Second Temple of Jerusalem was deliberately destroyed by Romans in 70AD, yet decades before, that Temple had become redundant as a place of worship. For, at the very moment that Jesus died, the Bible records that the giant curtain of that temple was torn in two. No longer was that stone building in Jerusalem to be the place to meet God, for now they would meet him in Jesus Christ. It is natural for us to feel sentimental about our buildings, and it was right to be sad when Notre Dame and the Temple of Jerusalem were damaged or destroyed. Yet, the greatest destruction was on the first Good Friday, when the Son of God was executed as an innocent man on behalf of those who trust in him. However as promised, Jesus was raised from the dead on Easter Sunday, and with his resurrection comes a certain hope that can never perish, spoil or fade. This Easter, as you reflect upon the fragility of life and the certainty of our own passing, it is a great time to trust in Jesus and enjoy the forgiveness he offers and the hope he promises. GOOD FRIDAY 9am: an all-age service to reflect on the death of Jesus for us. EASTER SATURDAY 5pm: an all-age service with kids’ program, followed by dinner together. EASTER SUNDAY 9am: a classic Anglican service followed by espresso morning tea. On Friday, I’ll be preaching on how the death of Jesus is actually a great moment of injustice… but Jesus did it for us. It’s all about the two criminals on the crosses who died alongside Jesus from Luke chapter 23. Then on Saturday and Sunday I’ll be preaching from John chapter 17 verses 20 to 26 where we find out what Jesus prayed for us on the night before he died, and why this changes everything. 1 What warnings does the Bible give about dreams? 2 How does God look down on everybody at the same time? 3 Is it God’s job to love us? 4 How did Jesus act under authority when he is the Father? 5 Do we believe that holy water will protect us from sickness? 6 If your relative goes to Hell, then will you feel sad? 7 Why didn’t Jesus tell Judas not to betray him? 8 Should we forgive Judas for his treachery? 9 Would you agree with Mikhail Gorbachev’s who said, “Even God didn’t create a perfect world; even God couldn’t cope with this society; I don’t think that was his plan”? This is a very special weekend to join us for church, so we’d love to welcome you with us this Easter. Grace and peace, Jodie McNeill. Jesus wants his disciples to ________ his prayer. Jesus has revealed the Father’s ____ to his people. Jesus acted under the Father’s _________. When you know Jesus, you know the ______. Jesus prays for the disciples but not the _____. We have eternal __________ because Jesus wants glory. The disciples need ______ support. Jesus prays that the disciples ___ like God. Our Christian unity needs to be based on _____. We need keeping in God’s name so we don’t ____ away. God is in _______ of evil as much as good. Jesus wants his disciples filled with ___. The disciples don’t ___ into the world. Jesus wants us to be _________ by the Father. As we are gentle and respectful we will be _____ about Jesus. The Devil doesn’t want us __________ to the world. Jesus has ________ the Devil, and has given us the Spirit. The moment you trust Jesus, you are ____ in God’s sight. We could only be holy because of a ____. This weekend we continue our three-week series ‘What would Jesus pray’ from John 17, as we examine in this second talk what Jesus prayed for his disciples in verses 6 to 19. Next weekend we finish our series on Jesus’ prayer by looking at what he prayed for his followers from 17:20-26. Check out the all-new titles! On Saturday 27th April we welcome Cameron Jones from the Anglican Church of Ireland, to preach and share about his plan to plant a church in the most gospel-poor, English-speaking nation. Irish dinner, trivia, and much more! He will also preach at 9am. 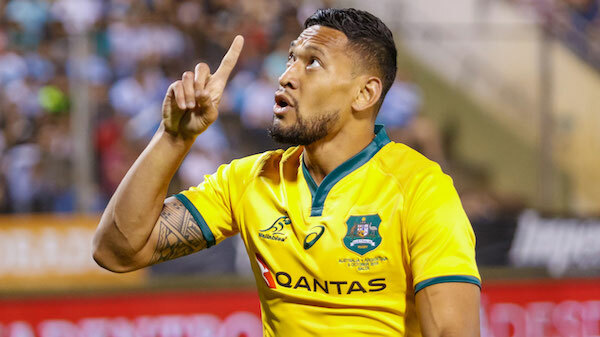 Why won’t Folau be quiet? Israel Folau clearly believes in Hell, and wants to warn everyone about it. In the comments he said “Jesus Christ loves you and is giving you time to turn away from your sin and come to him”, as well as quoting from the Bible. Folau clearly believes in Hell, and he wants to take every opportunity to warn people to find safety in Jesus. The response from Rugby Australia and the media is that his comments are “homophobic” and that he has “vilified” people by how he’s expressed his religious beliefs. To be honest, I wouldn’t post that image on Instagram, even though I agree that we need to warn people about Hell. Yet I, too, want people to know that no matter who you are or what you’ve done, Jesus loves you so much that he died to forgive you. Everybody is guilty of disobeying God in all sorts of ways, but no matter what you’ve done, Jesus offers unconditional forgiveness if you truly follow him. I love Izzy’s courage and conviction, and I share his passion for people to come to Jesus and be rescued from Hell. And I think he’s right when he says that God considers homosexual activity to be one of many things that are immoral. But whether you agree or not, surely it’s un-Australian to sack someone for publicly saying something that’s in the Bible. We used to think, “I disapprove of what you say, but I will defend to the death your right to say it”, but now our society silences views that are unpopular. Nobody likes to be told that their behaviour is wrong, yet all of us are guilty in Jesus’ sight for all we’ve done to offend him. At the same time, all of us can enjoy forgiveness in Jesus because of his self-sacrificing death on the first Good Friday. Speaking to many people last week, it was clear that the new Bible Talk series on Jesus’ prayer to his Father has really had a big impact on us. Jesus prayed for his glory, so that his Father would get the glory, and because of that, his chosen people get certain eternal life. Amazing. If you missed the talk then you can catch up by listening on our Talks page. So, be sure to join us this coming weekend for the next instalment as I preach from John chapter 17 verses 6 to 19, as we hear what Jesus prayed for his disciples, and what that means for us. If you’ve never joined us before, then you really need to pop in! We absolutely love visitors, so come along at 5pm on Saturday for an all-age service with kids’ program, a terrific dinner together, then youth group for the teenagers afterwards. Or come at 9am Sunday for a more classic Anglican service, followed by espresso coffee at morning tea. 1 Is it OK to be single or a virgin if you’re not wanting to grow up to be a nun? 2 Is it acceptable to divorce if the husband and wife were not Christians when married, but one later becomes a believer? 3 Whilst we won’t have married relationships in heaven, won’t we still know people there? 4 Will we feel sadness in heaven about the people who are suffering eternally in hell? 5 How is there any ‘cool’ way to die? 6 Why does God choose to save some people but not others? 7 Can we truly forgive someone who continues to do wrong to you and doesn’t repent? Can’t wait to see you this weekend!